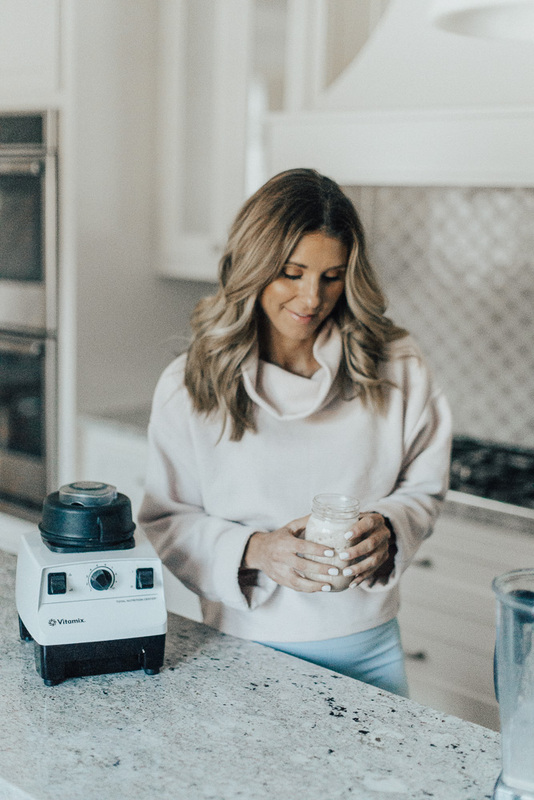 Today, I’m sharing my morning routine with you. I try to stick to this every day. Of course some days, things don’t go quite as planned. We all have those mornings where you just can’t get out of bed or nothing goes your way! But I encourage you to take time for yourself in the morning. You deserve it! And when you put yourself first, you are able to be a better boss, mom, coworker, partner, and friend all day long. 6 a.m. – Alarm goes off, I go straight into my workout clothes, brush my teeth, and ready for my workout. Depending on my week, I either go to a workout class (Fusion Fitness KC) or I work out at home (if Michael is traveling). For the days I work out from home I like to use my Bosu ball, kettle bells or bands. Walmart has an awesome selection of workout equipment…from weights, kettle bells, mats, and bands, they literally have it all. I just recently got this Bosu ball and love all the different workouts you can do with it AND how it is a total body workout. Scroll down to see my current workout with Bosu ball! 7:30 Done with workout and by this time I have drank 32 oz of water. Drinking water right when you wake up will help hydrate you after a night’s sleep, plus it will get your metabolism going. 7:30 Kids wake – Michael or I will get them dressed and get them breakfast. 7:50 – Sutton out the door to school. Greyson stays home with our nanny. Around 8 a.m, I have breakfast. I like to have both protein and carbs and I am a creature of habit and have the same thing almost EVERY single day. I make a protein shake and a serving of oatmeal and coffee, duh! Recipes below! Blend until creamy – I love the Vitamix Blender – my shakes are so smooth and creamy! Some days I half a frozen banana in the mix. If on the go, I use this blender bottle. I am picky about my protein and love this kind from Walmart in both the vanilla and chocolate. I ALWAYS add powdered peanut butter bc it makes it creamy-like ice cream! Walmart also has a HUGE selection of organic food. I order so much of our food with the free 2-day shipping. I find almost all of our grocery list which is so convenient. Linked a few favorite snacks and items we order on the regular below! Q: Why did I decide to work out in the morning? A: Because there are no excuses… Seriously, there are no distractions when I work out in the morning, and more importantly, there are no excuses not to. I can’t be already running behind schedule, no one is calling, and everything is relatively serene (including the animals!) After that, I do not have to worry about when I will be able to do my work out, because I’ve already finished it, and I can just focus on reaching the rest of my day’s goals and to-do lists. It is not difficult to work out in the morning, you just have to get used to it. Yes, it can be extremely hard when you first start out, but only after about one week of doing it, your body will begin to adopt – you just need to stick with it! It took me about two weeks to get used to exercising in the early morning, and it was really tough for me since I was not a morning person at all! But that’s it – two weeks and now it’s a habit. Q: Do you eat before your workout early in the morning? No, I do not. I prefer a fasted work out and try to give my body 12 hours of intermittent fasting on the weeknights. So at 8pm I have my last snack and 8am is when I will have breakfast. Read more on why I choose to intermittent fast here. Q: What are your favorite healthy snacks? 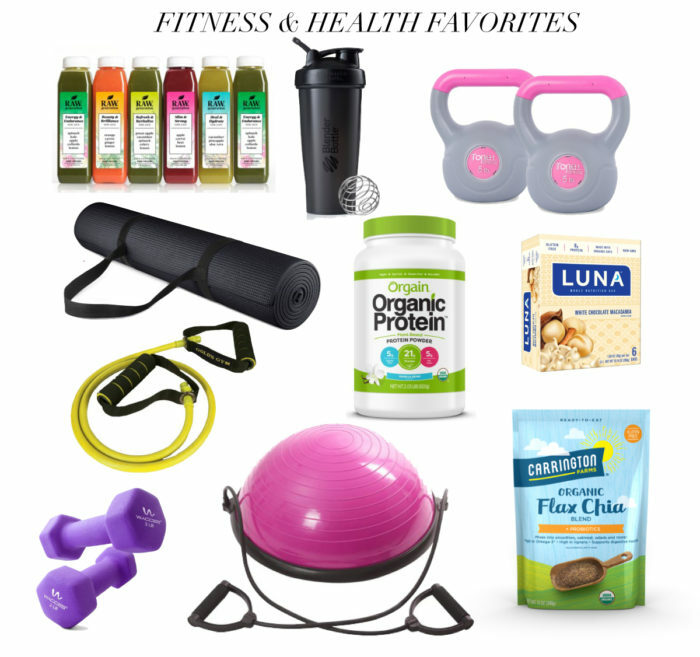 I love Luna bars, Pop Chips, Raw Juices, Skinny Pop, Kevita drinks that I order/pickup at Walmart. Q: How do you work out from home and not get bored? I have a decent selection of equipment so I am able to change up my work out each week. I have found the most effective equipment for me to use is my weights, kettle bells, bands, and bosu ball. This is just like a regular push-up except you are balancing your body while on the BOSU ball. It will help work your core, triceps, chest and shoulders. The bonus is you can improve your balance coordination. Aim for 15, rest for 30 seconds and repeat. Sit in the middle of the BOSU ball and find your balance. When ready, lift your knees up to a 45-degree angle and balance. You can put your hands slightly on the ball to help you find maintain your balance or bring them up in front of you. Try to hold this position for 15 seconds and build from there. Your ultimate goal should be one-two minutes. But, it takes time. Be sure to tighten your stomach and breath. Rest your right forearm on top of the ball, stack your left foot on top of your right, and lift your body off the ground. Make sure you’re in a straight line from head to feet. Contract your abs and squeeze your glutes. Hold for 30 seconds, then switch sides. Repeat twice of each side. Start in plank position over ball. Belly button over center of ball, extend arms and legs off floor so that entire body is in a straight line. Hold for 30 seconds, rest for 15, then repeat. Stand on ball, extend arms out and lift leg to 45-degree angle and hold for 5 seconds Repeat 10 times on left side, then do circuit on the right. Repeat entire circuit 3xs. Simple but effective move for the oblique. Lay with side on ball and lift leg to only 45 degree only and hold for 3 second, lower but don’t rest and lift again to hold for 3 seconds. 30 reps on each side. Repeat circuit 2-3 times. 9 // Finish with 50 jump squats! Repeat 9 circuits 2/3 times for a 30-minute full body workout! My whole motivation for working out and eating healthy(ish) is to take care of my body and have the energy to keep up with my day and with my babies. I work hard to be the best mom and wife for my family. My mood during the day is always instantly better when I get my sweat in, I feel like I have accomplished a huge to-do in my day. I hope you were able to find a few new ideas for recipes/snacks or workouts to fit into your daily routine. Again, this is what works best for me, it is not a perfect plan for everyone. Find what works for you and go for it! Do you have a morning routine? What does it look like? I love reading your guys’ routines! Absolutely loved the exercise tips. Loved this post! It was so informative. I recently changed to working out in the morning. My alarm goes off at 5 and it isn’t easy… at all… but I never regret it. It feels so good all day long knowing that I already got it in. You look so incredibly fit and strong! Way to go, Momma! Totally agree on the morning workouts! I started doing them about a year ago when I started working from home and now I love it. No excuses not to get it done and it makes me less stressed at work. Thanks for the breakfast recipe! I’ve been looking to add shakes to my diet! Great post! I like how detailed your posts and answers are when you talk about a subject. Have you ever tried Monk Fruit in the Raw? It’s a healthy alternative to sugar and it taste so much better than stevia. I never heard about this Bosu ball. So glad you shared it! I definitely want to get it now. Thanks for showing what kind of exercises you do with it! Key phrase here: Greyson stays home with our nanny. Not every Mom has the luxury of having a nanny to watch your kids while you get to go pamper yourself, take photos of yourself and encourage people to go buy more stuff. At first I liked your blog but I’ll have to stop reading because it just makes me feel bad about myself. Get to pamper myself?? I work out in the early morning before any of my kids or husband are awake so that I can WORK my but off from 8-6pm every day. And in order for me to work and provide for my family, I need childcare aka nanny. I am sorry you feel the way do you. Maybe before you judge my life or what I do, maybe know the whole story. If you only knew how hard I work for my family you would not be commenting. To each their own! Well wishes, Dana. Great post! I woke up early to workout last week and it felt so great. Question for you, did you use a service to find a nanny? I’m in the KC area, work from home and am starting the search. I’m starting with care.com but wanted to make sure there isn’t anything else out there! Thanks!